Museum hours are 9 a.m. to 4 p.m., Monday through Friday, with extended hours until 7 p.m. on Thursday. 9 a.m. to 5 p.m. Saturday and noon to 5 p.m. Sunday. Joseph Gross Gallery hours are 8 a.m. to 4 p.m., Monday through Friday. Closed weekends. Until last week, I'd never even thought of buying fries in an art gallery. That changed when I caught the greasy scent of the deep fryer wafting through the Masters of Fine Art Exhibition at the University of Arizona Museum of Art. Straight ahead, in between the quilts and photos and watercolors, was a McDonald's, open for business. Everything looked familiar: red cardboard containers with a yellow smiley face, steel counter and sink, and a lit-up ordering board at the drive-through lane. I stepped right up and ordered small fries from the young woman working the counter. I have to admit her wares were a little pricey, with fries ranging from $5 a pop to $219.99. But truth be told, these fries weren't potatoes. Never mind that phantom aroma I smelled. The fries were bits of yellow plastic. And they weren't actually being fried. Instead they were spitting out of a 3-D printer. 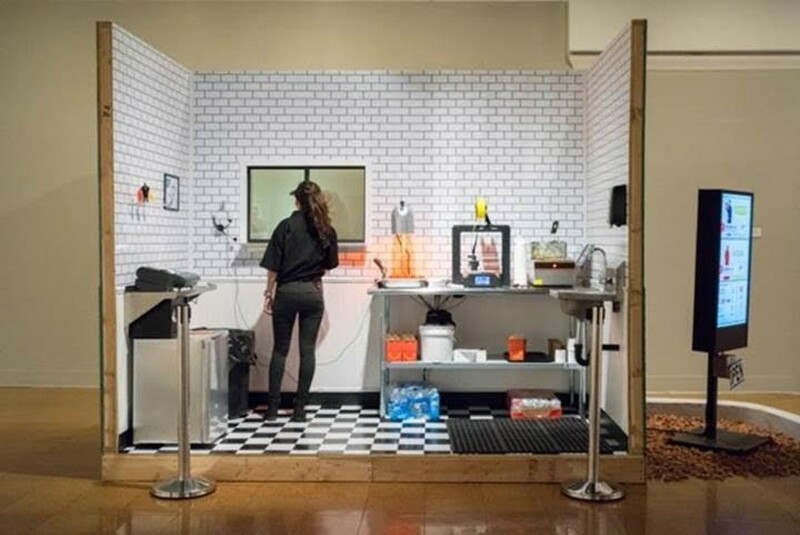 The museum's McDonald's is an elaborate art installation called "Rite of Passage, Product of the American Dream," by graduating master's student Oliver Padilla. The worker in the perky black cap was not a low-wage underling in McDonald's industrial food complex. She's an undergrad art student, Kelsey Lang, who was helping out Padilla. Padilla did above-and-beyond research for his life-sized restaurant piece by getting a real-life job at a real-life McD's. In between tossing potatoes into oil and shoving burgers into bags, he took a deep look not only at the sterile architecture of the fast-food joint, but of the difficult lives of its low-wage workers. His "multi-media and performance installation," he writes in an artist statement, is a "critique of the lack of economic opportunities for many young Americans as they enter the workforce." Defenders of low-wage operations like McDonald's argue that these enterprises offer entry-level gigs that will give workers experience to move on to living-wage jobs. But Padilla notes that many fast-food workers find themselves permanently "condemned to the underclass," with little hope of rising to better employment. They're not just teens working part-time for pocket change. Many employees are parents struggling to support families on minimum wage. A first-generation American who feels privileged to have gotten a university education, and the "unlikely opportunity of graduate study," Padilla says his provocative piece also honors the immigrants who do the lowliest jobs for Americans. Sly texts slipped onto the installation's bland signs advise viewers to celebrate and "commemorate the immigrant in your life." The UA's MFA show is a double annual pleasure. It gives art lovers a chance to see ground-breaking new media, like a faux McDonald's—and to see idealistic, and sometimes righteously angry—young artists tackling the big issues of the day. Besides Padilla's take on poverty, immigration and corporate indifference, this year's crop of 11 MFA's look at climate change, refugees, racism and racial identity, feminism, overdevelopment of nature, and mental and physical illness. Their innovative materials include ice, dirt, rocks and plants. Videos and soundscapes are plentiful. And along with these experimental forms are the enduring classic genres: drawing, painting and photography. Leah Lewman is a gifted painter who finds new ways to use her old media. Five delicate little watercolors, part of her installation "From the Inside Out," are as finely rendered as any watercolor landscape from the 19th century. Lewman's pieces, all in the round, conjure the beauty of the Sonoran Desert sky and clouds, with small glimpses of the mountains below. But this artist is after more than pretty pictures. She imprisons these lovely skyscapes behind bars and slashing architectural drawings across them, the sketches' geometric edges contrasting sharply with the soft curves of nature. The drawings presage inevitable encroachment on the desert. Elsewhere, Lewman wields a brush loaded with oil, painting a large-scale black-and-white desert. She doesn't allow its creosotes and mesquites to rest easy, any more than she did her desert sky. She's sliced the painting into narrow strips and forced them into a corner: they seem to disappear into nothingness. Nearby, Hellen Gaudence's photos are just as lovely and just as challenging. An immigrant from Tanzania, Gaudence has made stark black-and-white portraits of African immigrants living in Tucson. Many arrived here from countries that have been wracked by violence, civil war and human rights violations. Posed against empty white backgrounds, these beautifully photographed figures are "decontextualized," Gaudence says, torn from their homes and familiar landscapes. Across the way in the Joseph Gross Gallery, three large installations occupy the entire space. Alissa M. Neal has taken over an entire wall with her "Point of Know Return, Kansas, 1977." Some 880 small baggies holding seeds, plant materials and tiny stones are pinned to a backdrop; arranged in a giant grid pattern, suggesting an elegant work of minimalism. But there's an elusive narrative here. Each bag holds material from a different location around the world. Viewers are invited to select a bag – the one I picked came from close to home, W. Ina Road in Tucson. Following Neal's written instructions, I emptied the bag into my hand and held its pebbles rocks under a powerful, and noisy, vacuum hose. The little stones, as if by magic, rose up into air and disappeared. Gauzy strands of white cotton and linen, loosely woven together, hang from the high ceiling in Janelle Krause's enchanted fiber work "Silent Like Snowfall." Some two dozen of these fairy-tale weavings sway in the air, like upside-down trees, or melting icicles. Jonathan Marquis's "A Geology of the Senses," a poetic examination of the fate of glaciers in an age of climate change, started out with some real ice. At the beginning of the exhibition, Marquis crafted a model of a glacier in ice. Now, weeks in, that glacier is gone, melted away in the warmth of the space. What's left are textured, deep-blue mixed-media paintings, a sculpture on the floor and a video whose soundtrack allows visitors "to listen for the ice creep"—the sound of a glacier disappearing.